Douglas, his wife Tracy, and their two dogs live in southern Colorado. 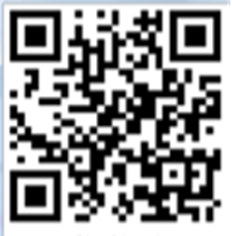 The heavily forested property is at 9000 feet elevation in the Sangre De Christo mountain range. The ranch borders a national forest, which, is bordered by the Sangre De Christo Wilderness National Park. The area is pristine and conducive for wildlife! Douglas has always had a very special place in his heart when it comes to not only domestic animals but wildlife and their habitat. Below, you'll find two special organizations that have captured Douglas' heart for their herculean efforts at rescue, rehabilitation, and sanctuary. Douglas has always had a special place in his heart when it comes to not only domestic animals such as dogs, cats, and farm animals, but especially for wildlife. This special relationship between Douglas and wildlife began at an early age. Douglas' father was in the military and the family was stationed on a military base in southern Alabama. Their family home was in the heart of a densely-wooded Alabama forest and visits by turtles, snakes, bears, raccoons, and skunks were a daily occurrence. Today, daily interactions with a myriad of wildlife is one of Douglas's most pleasurable moments in his life. Their Colorado property is home to black bear, mountain lion, deer, elk, coyotes, rabbits, foxes, and a long list of rodents of every kind. An even longer list of winged friends are his constant companion as they devour pounds of seed daily from the many bird feeders spread throughout the property. There’s just something special about this place. On any given day, about 1,700 animals call Best Friends Animal Sanctuary a home-between-homes. Dogs, cats, bunnies, birds, horses, pigs and other barnyard animals come here from all over the country, each and every one seeking a safe haven where they can find refuge, love and acceptance. "Being able to contribute time and monies to the rescue, rehabilitation and future well-being of mistreated animals and providing for orphaned wildlife is one of the tremendous joys in my life," says Schulz. Benefactors like Schulz and wife, Tracy recognize that some of the rescued and rehabilitated animals will never be able to leave the facility or can be released into the wild and will require a lifetime of support. In response, they've set up a foundation to continue their herculean efforts in perpetuity. 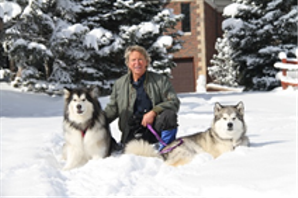 Schulz and wife, Tracy share their lives with their two Malamutes, Dimitri & Tevia in Westcliffe, Colorado. 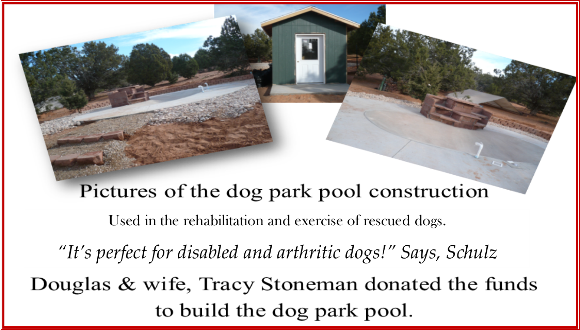 Wet Mountain Wildlife Rehabilitation Inc.
Douglas & wife, Tracy Stoneman donated the funds to construct, "Bear Haven," an enclosure that allows our cubs to enjoy freedom of movement and opportunities to grow in a safe environment. 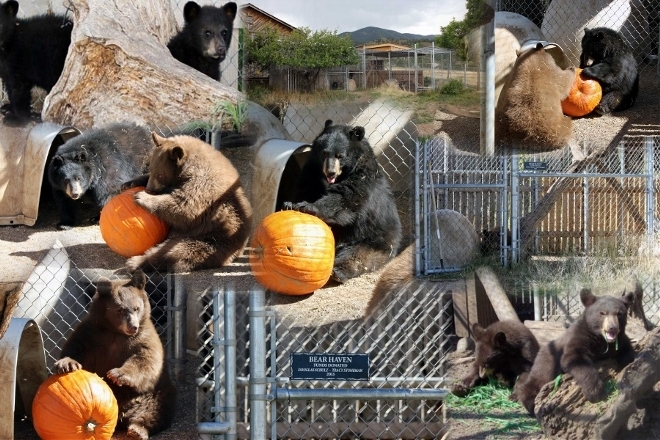 "Wet Mountain Wildlife is one of only three facilities in Colorado that deal with these large animals." The best obtainable nutrition, and a quiet environment is provided until they are healthy and mature enough for release. Douglas' love for earth's less privileged creatures, goes way beyond his daily interaction. He has been generously giving to various animal rights and protection organizations for 40 years. How this wildlife lover & funder finds his daily dose of peace and fulfillment. Douglas Schulz is a complex man who has made a very successful career in one of the most stressful avocations, the securities industry. By day, he is a securities expert witness and at 65 years old still spends 10 hours a day, six days a week preparing case work to testify nationwide before securities arbitration panels, in state, or federal courtrooms. Due to his work ethic and schedule, daily walks and time to observe wildlife on his 160 acre ranch in Colorado is not always possible. However, when time permits, Douglas joins his greatest loves, wife Tracy and their two Malamutes, Dimitri & Tevia to walk the hills surrounding their home balancing the hectic world of the securities/financial industry and his love of wildlife. “It’s all about the animals!” Schulz says, and he backs up this statement with life-long donations to animal rescue and wildlife sanctuaries. With no heirs, Douglas and Tracy have designated that 100% of their estate be donated to an animal rescue society and a wildlife sanctuary. Through their gift, a lasting inheritance will provide for the critical care of rescued/unwanted domestic animals and wildlife that require specialized care and large open spaces to exist away from human meddling. Douglas has spent thousands of dollars and employed a seasoned logging crew for a three-year project preparing the densely-forested areas of his ranch to continue to support sustainable large tree growth and provide a healthy environment for wildlife habitation. At over 9,000’ the once over-stocked forest and its 160-acres is now thinned and able to sustain itself through years of continued drought, bark beetle infestations, and is less susceptible to catastrophic wildfire. 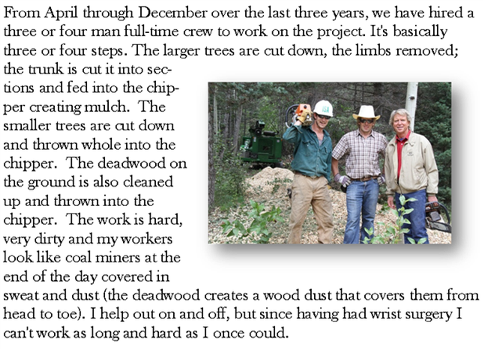 Douglas’ project was featured in a University of Colorado documentary on Colorado’s sustainable forests. As I’ve discovered through my years of friendship, Douglas Schulz, a complex man, has a heart bigger than Colorado for animals and the environment.